"Western Round Table" is an interpretation of a meeting held in 1949 on Modern Art in the Mojave Desert, where a group of men from the fields of art, literature, criticism, music, science, philosophy, architecture, including Marcel Duchamp, Frank Lloyd Wright and Gregory Bateson had discussed contemporary artistic practice, its modernist legacy and future. The exact location of their meeting is unknown. "Western Round Table" is an enigmatic monument of this meeting and articulates what might be its source material within an abstract outside of space of time. 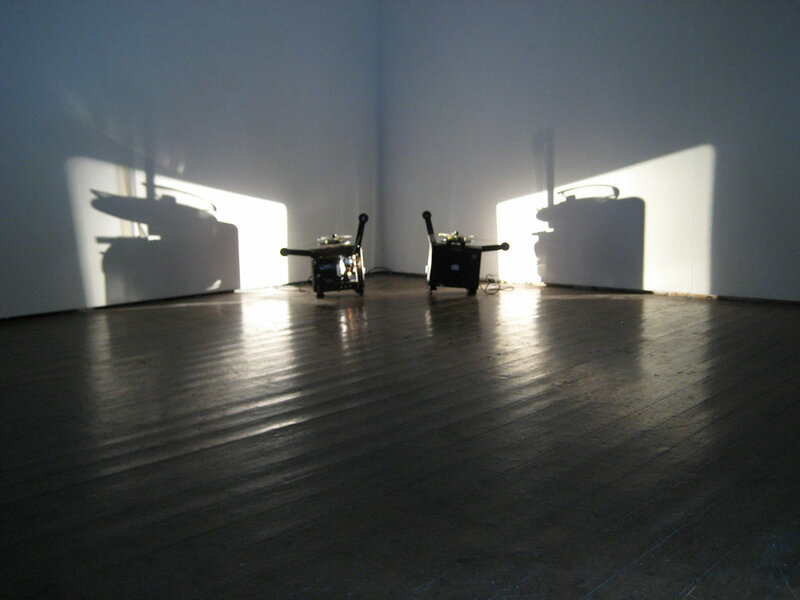 The two projectors are facing each other and speak/start processing at the same time, projecting loops of clear 16mm film that sit on top of them like hats and carry optical soundtracks of feint chimes (one base, one melody). The light of each projector's bulb throws the silhouette of its opposite large onto the gallery walls, their shadows looming like characters.